Blaze west of Wood River Valley deemed No. 3 priority in U.S.
As firefighters secure the southwestern side of the Beaver Creek Fire to keep it from swinging back toward Fairfield, resources will be freed up to attack the eastern tentacles of the blaze in the headwaters of Deer Creek and Warm Springs Creek over the next few days. That’s the plan that fire managers presented to their crews during a briefing Monday evening at an incident command post set up along Buttercup Road north of Hailey. On Tuesday, firefighting officials reported that the blaze was 10 percent contained and that significant progress was being made on the southern flank. However, the fire continued to march north past the Warm Springs drainage toward the Baker Creek drainage. The fire was sparked by lightning Wednesday, Aug. 7, about 12 miles northeast of Fairfield. It burned into more timbered country to the northeast on Thursday, then, pushed by southerly winds, roared north for eight miles on Friday afternoon along the ridges separating Blaine and Camas counties. The fire grew by 3,800 acres Monday, to about 32,000 acres, and is now threatening to move down drainages leading to the Wood River Valley. But incident commanders face a challenge finding the resources they need as Idaho has become the nation’s fire hot spot, with the Elk Complex and Pony Complex fires, in the Boise National Forest north of Mountain Home, having become the top-priority fires in the country. The Beaver Creek Fire is deemed the No. 3 priority in the nation. A Type 1 Incident Management Team was dispatched to the Wood River Valley on Sunday, and people and supplies continued to arrive Monday. At 6 a.m. Monday, Incident Commander Beth Lund took charge. By that evening, the former alfalfa field on Peregrine Ranch between Buttercup Road and state Highway 75 contained 10 big tents, 87 personal tents and 45 portable toilets. Logistics Chief Jim Starling said 100 people were fed breakfast there Monday. “I think the team has done a great job of getting organized,” Lund said at the briefing. Firefighters here are sharing resources, including eight helicopters, with the team battling the McCan Fire, which had grown to almost 24,000 acres Monday about four miles northwest of Fairfield. A total of 340 firefighters were working on the Beaver Creek Fire Monday, most based on the western side. The effort on the Wood River Valley side has so far focused on aerial attack while fire managers scout the fire’s perimeter and plan ground strategy. “As long as we’re able to keep things moving efficiently, we’ll have quite a bit of air support in the next couple of days,” Air Operations Branch Officer Brad Koeckeritz said. Koeckeritz said a mobile retardant base has been set up at Clarendon Hot Springs, about five miles up Deer Creek Road. Operations Section Chief Jeff Surber said in an interview that the retardant is transported there in dry form by semi truck, then mixed in a tank with water from a pond there. “The helicopters come in with their buckets and dip them into the tank,” he said. The fire burned into the Deer Creek drainage down Curran Gulch and Kinsey Creek, then jumped across to the north side of Deer Creek. Surber said about 30 people were working on the ground there Monday, and another 20 were expected to move over from the fire’s western side on Tuesday. According to a news release from the U.S. Forest Service, those efforts will focus along a ridge that runs between Wolftone and Kinsey creeks. Surber said that between Deer Creek and Warm Springs Creek, the fire is more sheltered from the wind and is moving more slowly. He said only about 10 people were working on that section, scouting for places to put resources as they arrive. The fire moved from the high ridges into upper Warm Springs Creek over the weekend, then jumped Warm Springs Road and is now burning in the Placer Creek and Spruce Creek drainages. On Monday, it moved up the ridge west toward Dollarhide Summit, west of Ketchum. According to the news release, hand crews on Tuesday were working south of Shaw Mountain, which is north of Warm Springs Road just east of Dollarhide Summit, and at Placer Flat. Crews will use natural barriers, fire scars and topographical features to slow the fire’s progress, and they’ll be supported by aerial resources. A spot fire, about a quarter of an acre in size, was reported Monday evening northeast of the main fire in Warm Springs. Fire-fighting planners are hoping to steer the fire toward the area burned by the Castle Rock Fire in 2007. That fire started about 10 miles west of Ketchum, on the south side of Warm Springs Creek, and quickly moved north and east, threatening the town and the Bald Mountain ski area. It burned about 48,500 acres. However, the effort will not be helped by the weather. Jeremy Wolf, with the National Weather Service in Spokane, told firefighters Monday that dry and unstable weather is expected from Wednesday through Friday, and winds are expected to pick up when a dry cold front moves in on Saturday. The Ketchum Ranger District on Tuesday implemented an area closure that includes all roads and trails on the west side of Highway 75, including Baker Creek Road. The entire Fairfield Ranger District is also closed to public access. Blaine County Sheriff Gene Ramsey said his office did not foresee any home evacuation orders at this time. “It all depends on fire behavior,” he said. On Monday, the Blaine County commissioners approved a disaster declaration for the county as a result of the fire. The declaration makes the county eligible for state emergency assistance. On the same day, Gov. Butch Otter declared the state to be a disaster area. 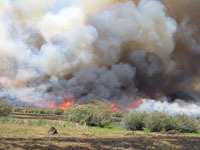 According to a news release from the Idaho Bureau of Homeland Security, the declaration provides authority to the Idaho Emergency Operations Center at Gowen Field to assign missions to state agencies and to process requests for financial assistance to the impacted jurisdictions, primarily Elmore County, where the state’s biggest fires are burning. Smoke has been drifting in and out of the Wood River Valley since the weekend. On Tuesday, the Idaho Department of Environmental Quality reported that its outdoor smoke monitor at Hemingway Elementary School in Ketchum indicated an improvement in air quality from “Unhealthy” on Monday to “Moderate,” the No. 2 category below “Good,” though several observers interviewed said they thought the smoke seemed worse. Visitors to the Wood River Valley did not seem deterred by the smoke, as the valley’s towns seemed as busy as they had been before the fire started. Information meetings on the Beaver Creek Fire were scheduled for Tuesday, Aug. 13, at Ketchum City Hall and at the Legion Hall in Fairfield. Another meeting is scheduled for 7 p.m. today, Aug. 14, at the Wood River High School Performing Arts Center in Hailey. Information updates are available on the Blaine County website, www.co.blaine.id.us.